UPSC Civil Services Preliminary Exam, the first round of selection process for different All India Services like IAS, IPS etc, will be conducted on 19.05.2013 (SUNDAY), while the Civil Services Main Exam (written) will commence on 08.11.2013 (FRIDAY).The last date for receipt of Applications (Preliminary) will be 04.03.2013 (MONDAY). The details of the notification will be available in the UPSC website from 02.02.2013 and the same will be published in the ‘Employment News’. Update from UPSC: The Civil Services Examination, 2013 was scheduled to be notified on 02.02.2013.However, due to some unforeseen circumstances, this examination will not be notified on 02.02.2013. The revised date of notification will be intimated in due course. 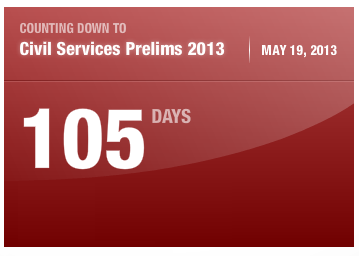 How to file the application for UPSC Civil Service Preliminary Exam 2013? The application has to filed online. Detailed instructions for the same are available on website http://www.upsconline.nic.in/. There will be two parts for the application – it is necessary to fill up both the parts i.e. part-I and part-II of the application. Once an applicant has successfully submitted the part-I and part-II of the application through online, the same gets registered with the Commission and the applicant is not required to send a hard copy of the print out of his/her application to the Commission’s office. After the completion of all the columns in part-II, a fresh page displays the message that the application has been submitted successfully. The generation of the unique registration ID number combined with the display of this message indicates that the application has been registered.